I found a new app… Surprise right! Well for those of you who know me personally, it won’t be. In this case, it isn’t an app for a mobile device (well not really) but a webapp that integrates with Evernote. Now, as a disclaimer, I’ve not actually used this for realtime work yet (just testing) but I’m pretty excited about the possibilities. 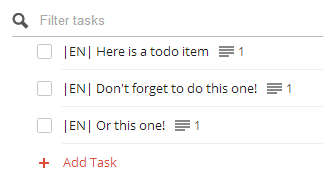 TaskClone does exactly what I want. It looks through your notebooks when you save a note (notes have to be tagged with a specific tag e.g. 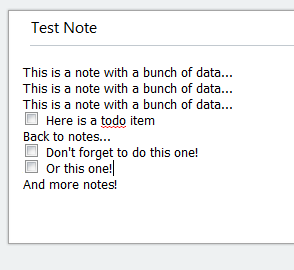 “notes” so TaskClone knows when to upload a note – you don’t really want to add the tag until you are done with the note – here is why) and if it finds an unchecked checkbox it grabs the text and sends it to a task list. I haven’t tried it (I have 14 days free on premium) but the free version is supposed to at least compile all your items into a single note. This in and of itself is a pretty good thing, and would work great if you aren’t using another todo app (or if you don’t have the $12/yr to put out for the premium version). At least this way you have all your task items in one place. TaskClone lists a bunch of apps that it supports but in this case I mean Native Support (I’ll get to the others in a second). There are a handful of apps that they support where it creates task using an api. (Nozbe, Toodledo, Wrike – interestingly I’ve tried them all and used Nozbe and Toodledo heavily in the past…) If however you don’t use one of those and you use another one, you are probably still in luck! If your app isn’t one of those, don’t fret! I use Todoist and it isn’t one of those 3 but it is on this list. The setup for this isn’t hard either. You need to get the email that you can use for your app to send tasks to your task list. For Todoist you have to pick a project (I picked Inbox) and get the email address for that project. Then you sync your Gmail account (this is a requirement because the app sends the emails from your gmail account). Then you are all set. Then you can see the emails are sent (from your gmail account) by checking your sent items. 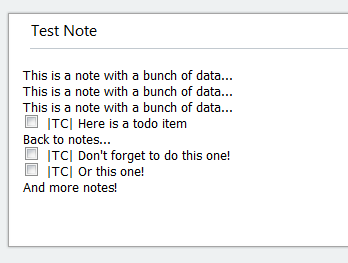 You can see that these tasks have “Notes” associated with them. That is the URL back to evernote so you can click back into the note to get context. This link is included in the email as the body. I’d love to hear any thoughts you all have on this so feel free to comment! Christopher, this is a great summary of what TaskClone does and how it works. In addition to sending tasks to your task app, TaskClone can also schedule events in Google Calendar all without leaving Evernote. Just type “schedule: meet bob at Jakes on Fri at 5pm” and TaskClone makes sure it appears in your Google Calendar. Thanks Troy. I did see that it can handle events but that isn’t something I’ve been missing in my workflow so I haven’t tried it. I will probably be purchasing a paid plan though because I’ve been enjoying the trial and the added functionality to my workflow.